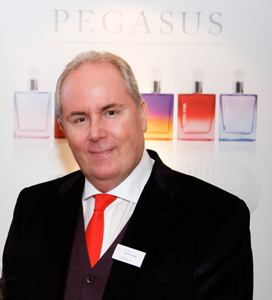 It is a great honour to be in the position of bringing another part of the vision of Vicky Wall into reality with the launching of Aura-Soma Pegasus, eight wonderful new varieties of perfume. The eight varieties that we have are the result of a co-operation with 'Creative Perfumers Limited' and its founder Anastasia. She has a 'nose of exception' which means that she has trained herself in a very special way to be able to balance essential oils and perfumes and to bring them together in total harmony. This is an increasingly dying art but, in my opinion, she is one of the finest exponents of this art in the world. We work in close co-operation with her because I believe she is also capable of what is referred to as synaesthesia. This implies cross-sensory perceptual ability. Anastasia has a set of Aura-Soma® bottles, the 110 different colour combinations. She requests that each of her client's visits begins in front of the Aura-Soma bottles She asks them to select the bottles that appeal to them the most, Anastasia then determines the fragrances based on those colour selections, her experience and what she has learnt. Over the years of development as the process continued we found that certain notes and certain colours came up time and time again. The eight fragrances or blends are related to specific Aura-Soma bottles. The number on the Pegasus bottle is actually directly connected to the number on the Equilibrium colour combination from the Aura-Soma Colour-Care-System®. This affirms the synaesthetic relationship between the perfume and that specific colour bottle. It is a complete circle of experience: colour to aroma, smell back to colour which is a tremendous thing in terms of what the world of fragrance, the world of perfume, the world of colour is going to experience.